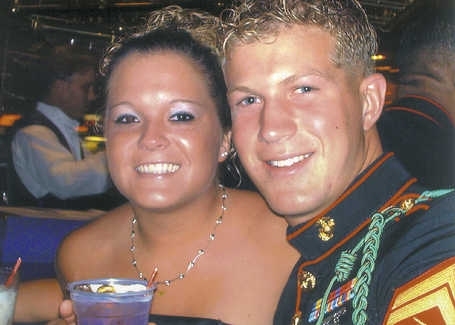 Spiritual Warfare Needed - Marine Corporal David Emery Jr.
A lot of you ask what you can do. In some cases, you can do a lot like adopt a soldier or donate to help wounded soldiers (ie. Valour-IT) at Soldiers' Angels. In other cases, prayers are simply the most and the best that you can do. Marine Corporal David Emery Jr. of the Battalion Landing Team of the 2nd Battalion, 4th Marine Regiment, 15th Marine Expeditionary Unit was serving in Iraq. David, aka "DJ", graduated high school in 2003. He is married to the beautiful lass in the above photo, Leslie, and she is pregnant. DJ's unit was extended past their rotation date of January 1st and he was hoping to make it home in time for his child's birth. On February 7th, 2007, DJ was at a checkpoint near a crowded place when a terrorist walked up to the Marines. DJ's Battalion Sergeant Major, Joseph Ellis (a recon Marine of 23 years), suspected that a bomber was approaching and put himself between the bomber and his Marines. The bomber quickly detonated himself, instantly killing Sergeant Major Ellis. The Sergeant Major's sacrifice absorbed enough of the blast to barely keep DJ from being killed. DJ was hit hard in his abdomen - an artery was cut causing kidney failure - both legs and one arm were shattered, and, in fact, his wounds were so severe that doctors didn't think that he'd make it. They had him on a respirator, fighting infection, fever, kidney failure and other problems for a time before he stabilized enough (just barely) to make the flight to Germany where his parents and wife met him. While still unconscious, his family kept telling him to fight. Then, on the 18th, DJ was strong enough to make the trip from Germany to the US (Bethesda). DJ had a tough surgery yesterday. His prognosis is hour to hour so prayers at anytime are needed. DJ and Leslie will have a little girl soon. I think I'll be able to get you Baby Shower information at a later time. DJ's father, David, attended Sergeant Major Ellis' funeral at Arlington Cemetery on the 21st. Sergeant Major Ellis' daughter Rachel said, "He just wanted to make a difference. Anytime he was asked to go somewhere, even times when he didn't have to, he would. He wanted to be there for his troops." Sergeant Major Ellis was 'Always Faithful' to DJ. Like Soldiers' Angel MaryAnn, we should be the same. At this point, please pray for a miracle.